Ten issues of the student newspaper from the Henderson Institute are now on DigitalNC. The Henderson Institute was founded in 1891 with the goal of educating the black community. It was funded by the United Presbyterian Church. The school closed in 1970 but maintains an active alumni group and our partner, the Henderson Institute Historical Museum stands on the original grounds of the school in Henderson, NC. 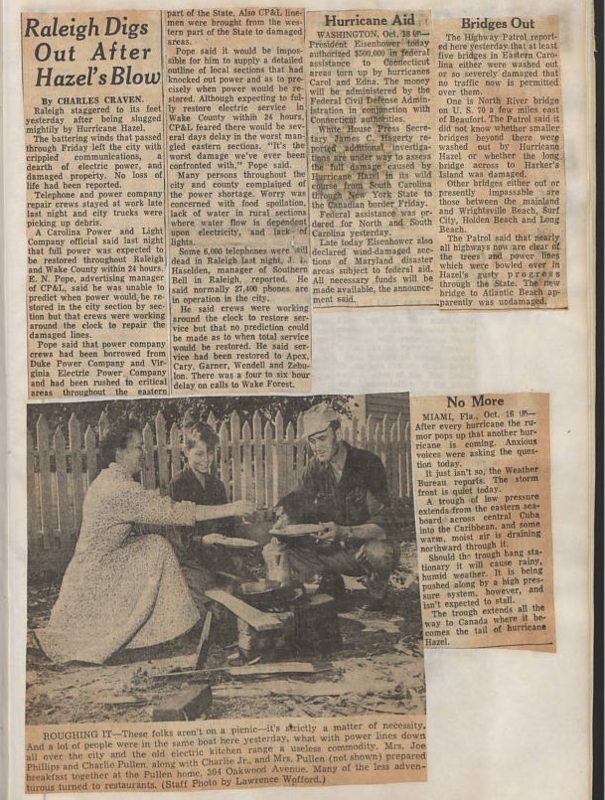 The topics covered in the paper include events happening at the school, topics of study in classes at the school, as well as important events in the black community both locally and nationally. The issues of the paper span 1937 through 1969, showing the evolution of the school in the middle of the 20th century, including some very interesting papers from the World War II era where there is discussion by the students of the juxtaposition of the United States push for liberty abroad while race relations on the home front remained fraught. 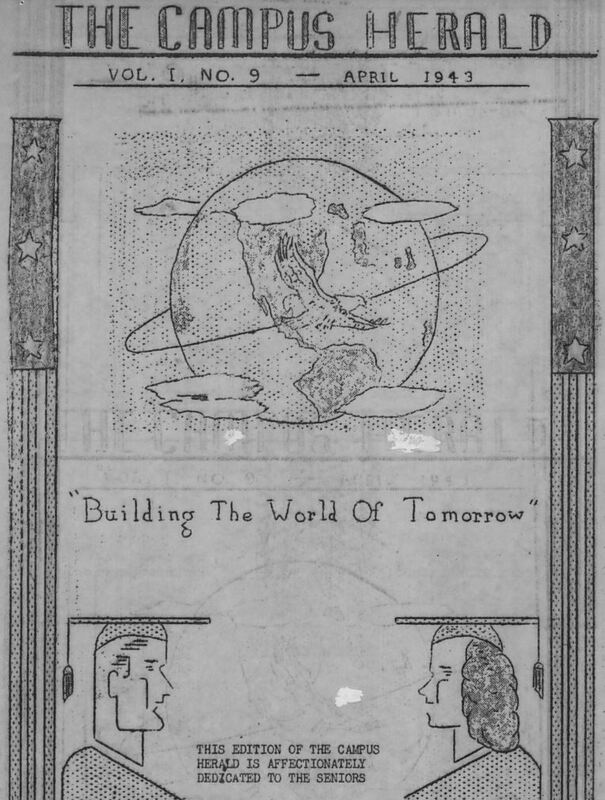 The early papers published in the 1930s were done under the direction of the English department but later issues appear to be have been produced by a specific group of the student body independently at the school. To learn more about the Henderson Institute Historical Museum visit their partner page or their website. To see more newspapers from across North Carolina, visit our newspaper page. A few weeks ago, our partner Wayne County Public Library brought three over-sized materials for us to scan here at the NCDHC while they waited. 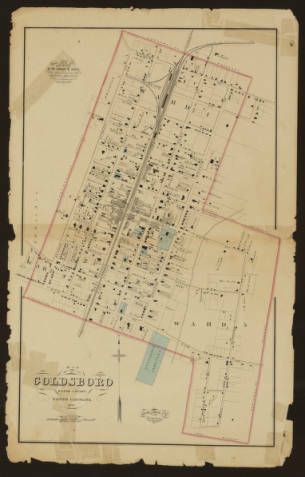 The items were a beautiful map of Goldsboro from 1881, and two posters related the building campaign for a memorial building in honor of those from Wayne County who died in World War I. While we scanned these items, folks from UNC Communications stopped by to see us in action. You can see the footage they shot of our scanning processes here. Learn more about our partner Wayne County Public Library on their partner page, or on the Wayne County Public Library website. Last summer we hosted students from a middle school in Wilmington who did extensive research on the 1898 riots in Wilmington. They came along with staff from the Cape Fear Museum, who brought the issues of the Wilmington Daily Record the museum held. 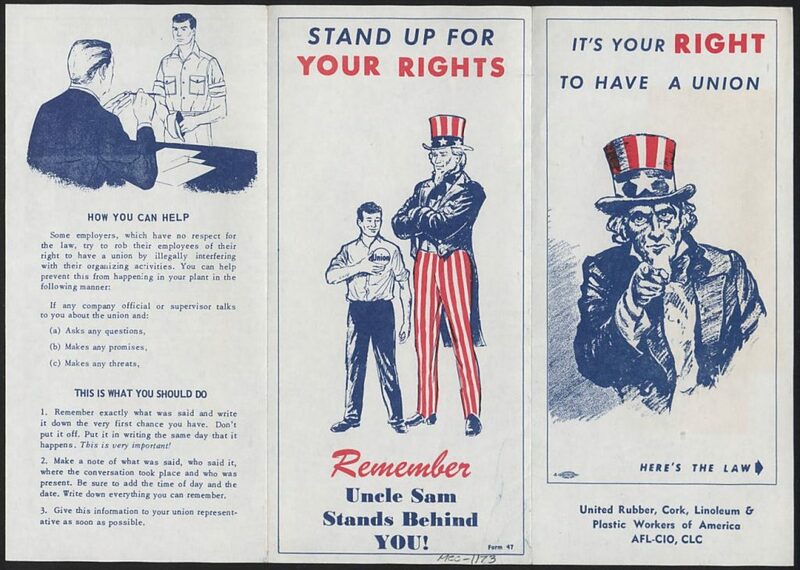 We scanned those newspapers on site, along with clippings from papers around the state and country with articles about the riots. To learn more about their visit, read the post we did about it during the summer during the summer here. This fall, as a continuing part of our work with this group, we were pleased to make available 16 newspapers published in Wilmington during the 19th century, ranging in dates from 1803 to 1901. Some of the papers have several years of content available and several have just an issue or two. 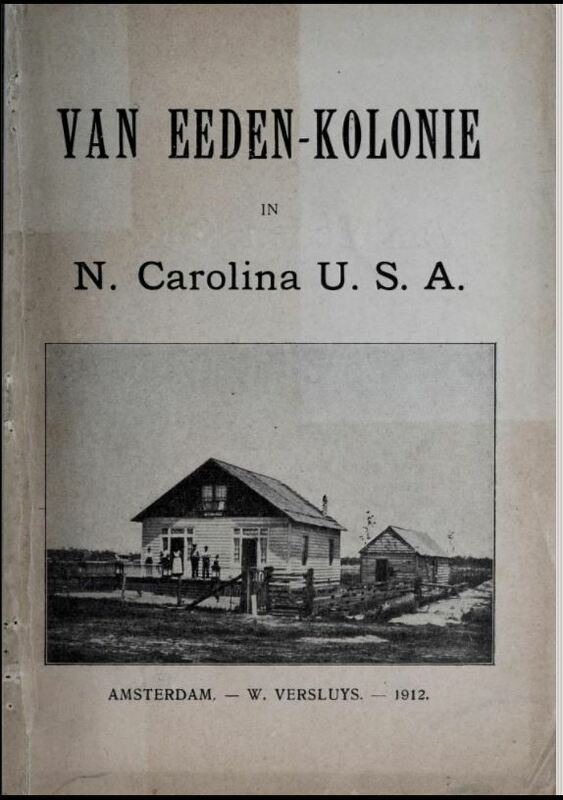 But together, they paint a rich picture of what life in Wilmington looked like during the 1800s and the wide variety of political viewpoints that were held in the city, and North Carolina as a whole. The papers shed light on a port town that was instrumental in the Civil War and in the politics of Reconstruction afterwards, which culminated in the infamous riots of 1898. View other newspapers on DigitalNC here. 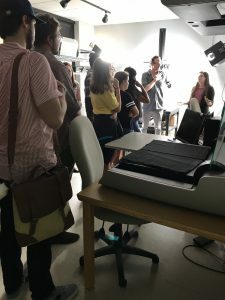 Back in August, DigitalNC was excited to road-trip over to Raleigh and test out our plan for onsite digitization at the City of Raleigh Museum whose staff kindly agreed to be our pilot location. The collection we worked on while there was the Madlin Futrell Photograph Collection, a great collection of photographs primarily from the 1950s. Madlin Futrell was a professional photographer who lived in Cary, NC and worked for the Raleigh Times, the North Carolina Office of Archives and History (now part of the North Carolina Department of Cultural and Natural Resources), and on a contract basis for several other institutions. 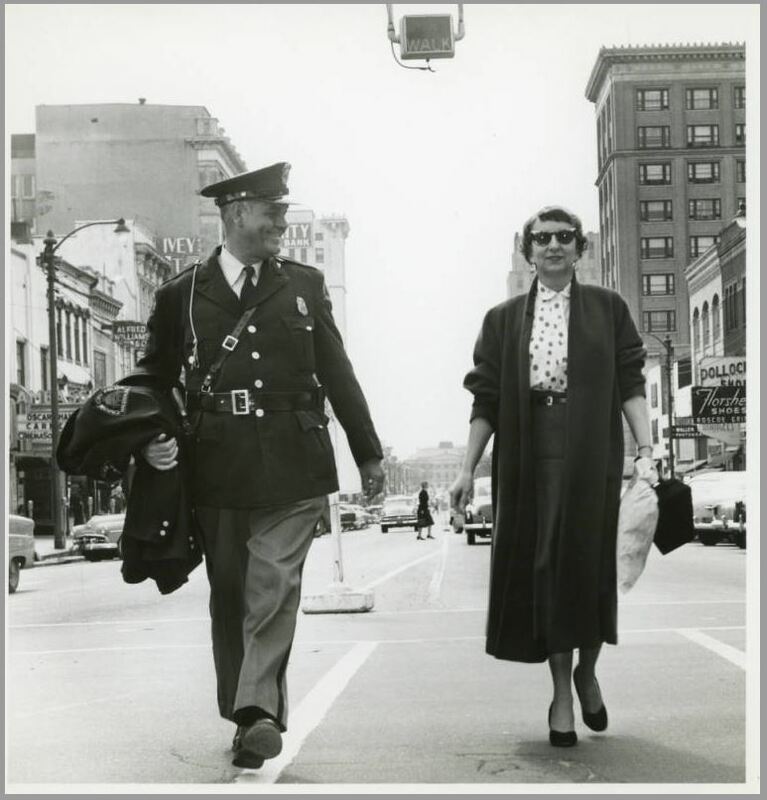 The photographs we digitized include location photographs of the Raleigh area, employees in the NC Office of Archives and History, historic sites around the state, and of President Eisenhower’s visit to the state in 1958. They offer not only a look at places around NC in the 1950s but also a look at the life of a career woman in mid 20th century North Carolina. Staff of the Hall of History in Raleigh, North Carolina. Photograph was taken in April 1960. 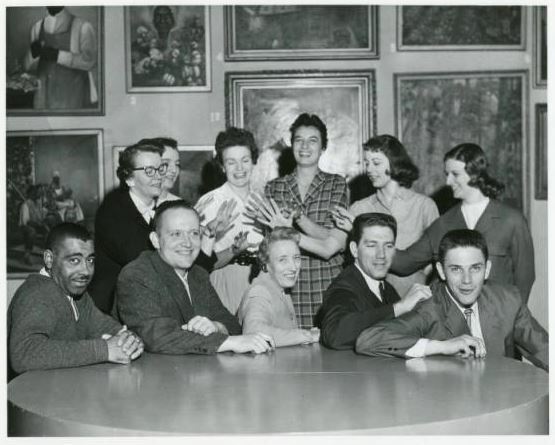 To view all the photographs digitized from the Futrell collection, go here. To view other photographs on DigitalNC, visit our Images of North Carolina site here. And if you’re interested in learning more about our onsite digitization program, please read about it here and apply if interested! This afternoon, the western portion of North Carolina will experience a total solar eclipse and the rest of the state will experience almost a total eclipse. 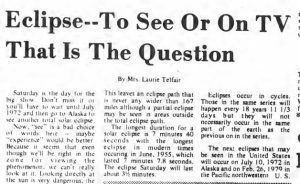 A peak into the newspapers on our site show that the rhetoric around eclipses has not changed too much over the years. Danger to one’s eyes is still the number one warning about watching the eclipse. 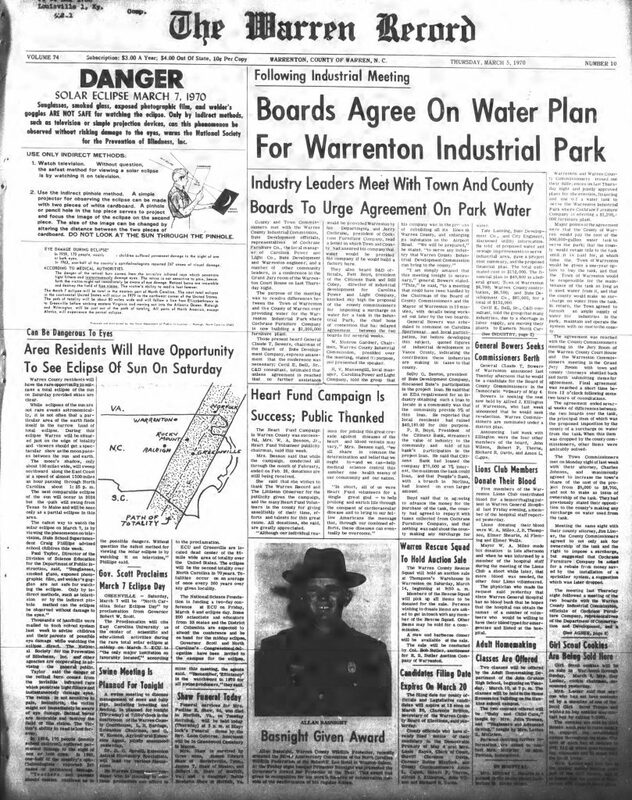 The front page of the March 5, 1970 Warren Record in Warrenton shouts “Danger!” about looking directly at the eclipse that was happening on March 7. 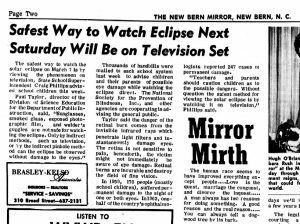 The New Bern Mirror noted about the same eclipse that the safest place to watch it would be on your television. The Mirror was not the only paper in 1970 to discuss watching on TV. It was a topic in the Raeford News-Journal as well. 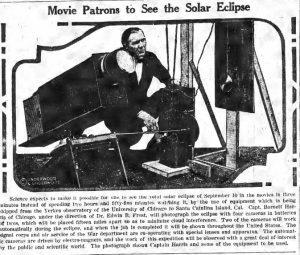 In 1923, many of the papers on DigitalNC ran a feature about the ability to watch the eclipse that year at the movie theater – a big innovation for the day. 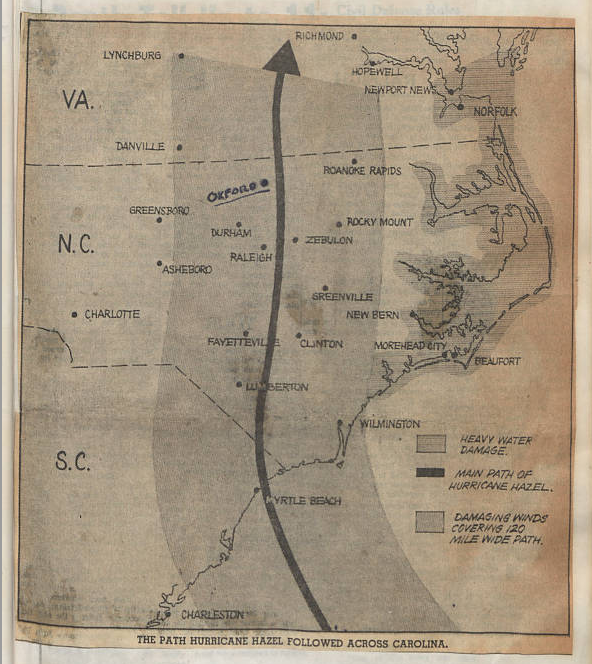 Perhaps our favorite find – and what may be of particular interest to those out in the western portion of the state – is an article found in the January 29, 1925 issue of the Brevard News, which noted a partial eclipse visible the weekend before. It also stated at the end that “Scientists tell us that not for 300 years will North Carolinians be able to see another one in their own state.” So either it was a misprint or scientists have had to do some recalculations! Wherever you watch today’s eclipse from – be careful of those eyes! And to read more eclipse stories in DigitalNC’s newspapers, visit here. In July, the North Carolina Digital Heritage Center was pleased to welcome a group of middle school students from Williston Middle School and Friends School Of Wilmington. With them were writers Joel Finsel and John Jeremiah Sullivan and staff from the Cape Fear Museum, all of whom worked with the students over the past semester. 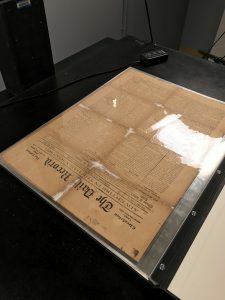 This visit was the culmination of a project for the students who had studied the Wilmington riots of 1898 and worked specifically with original copies of the Daily Record, held by the Cape Fear Museum. 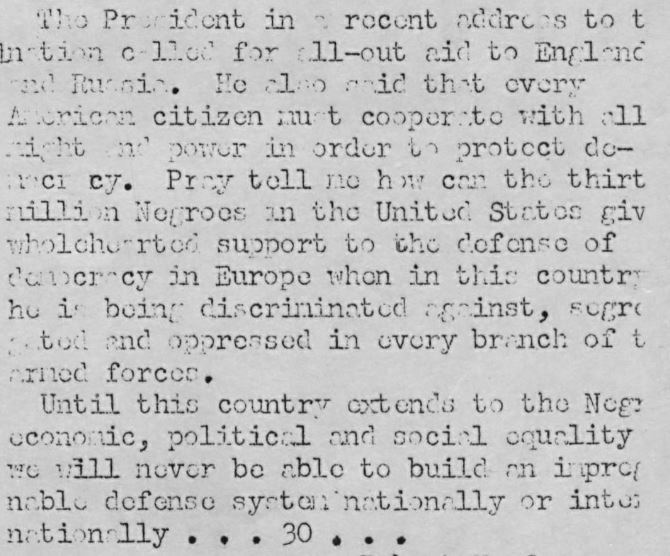 Original issues of the Record, which was the black-owned newspaper in Wilmington in the late 1890s, are incredibly hard to find: their offices were destroyed during the riots. (Learn more about the riots on NCpedia.) 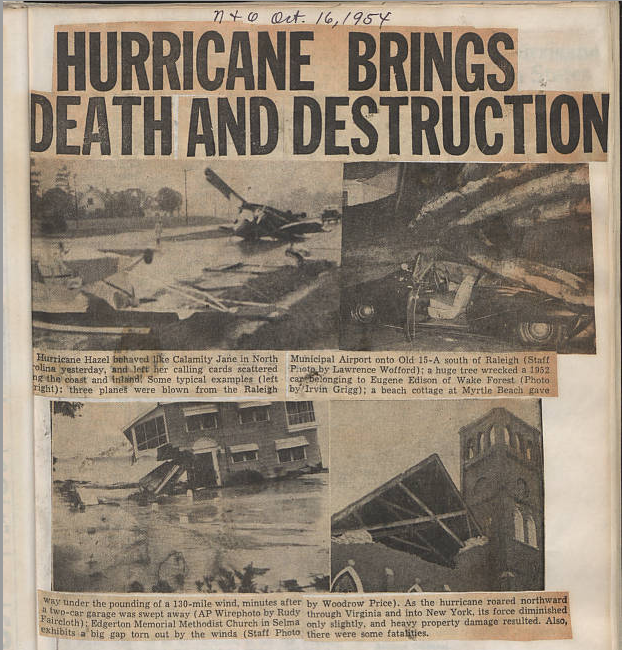 The museum staff brought along their copies of the paper, as well as original copies of the reaction to the riots as found in both black-owned and white-owned papers across the country. We scanned all of the materials on site with help from UNC-Chapel Hill Libraries’ Digital Production Center staff. Students watched and got to learn more about our work. Now all of those materials are online not only for future students to work with, but for anyone from the general public to access. And to view more newspapers on our site, visit our newspaper site here. 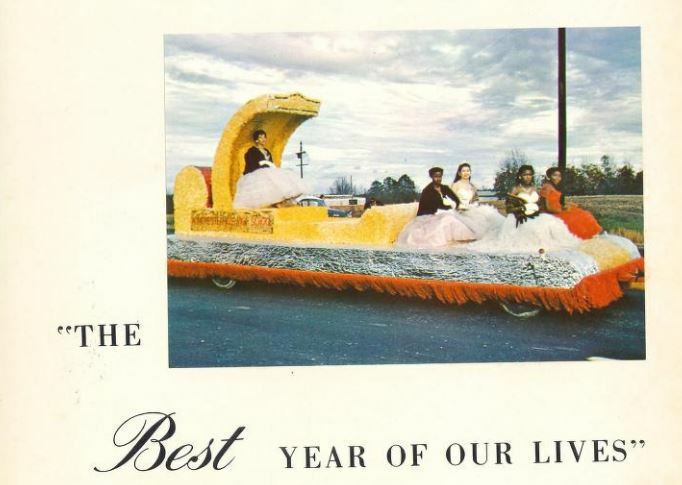 Thanks to our new partner, Union County Public Library, DigitalNC now features 3 yearbooks [1956, 1958, and 1962] from Winchester Avenue High School, which was the black high school in Monroe, North Carolina. Winchester first opened as a K-12 school serving the black community in the 1920s. 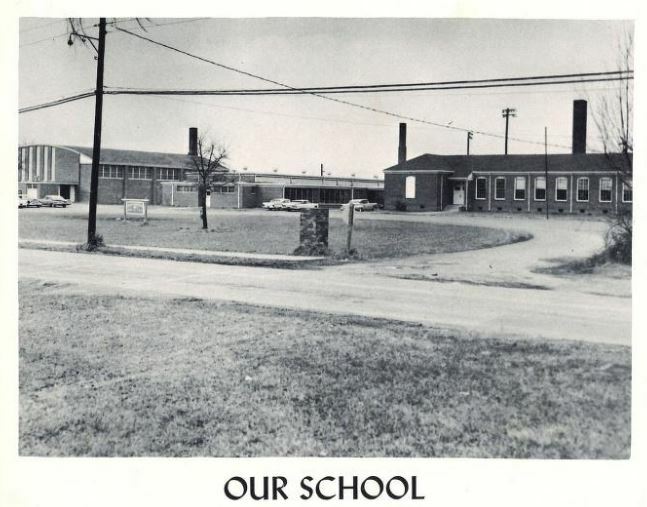 It was an important institution in Monroe’s black community, serving as a community center and point of pride for the many students who graduated from the school. That all changed in March 1966 when a fire heavily damaged the school. The high school students finished the year in the undamaged parts, but it was the end of Winchester as a high school. 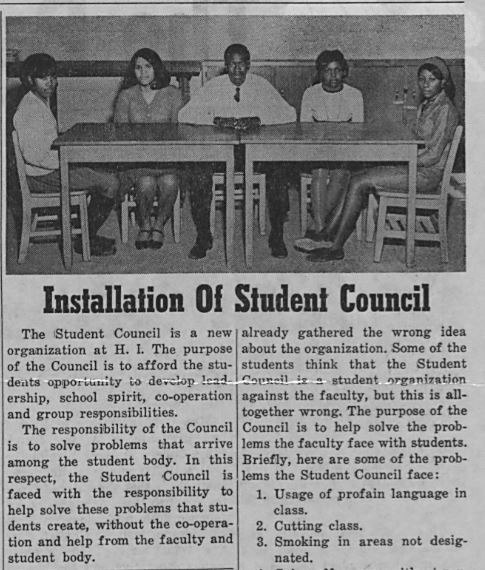 As a result, with no other options, the black students and faculty from Winchester all went to the all white Monroe High School for the 1966-1967 school year, making Monroe High the first fully integrated high school in the state. One of Winchester’s graduates is a trailblazer whose story has been highlighted very recently, Christine Darden. Darden is a retired engineer and executive from NASA Langley Research Center in Hampton, VA, and her story is one of the one’s highlighted in the book “Hidden Figures: The American Dream and the Untold Story of the Black Women Mathematicians Who Helped Win the Space Race.” Darden [Christine Mann is her maiden name] attended Winchester School through sophomore year before transferring to the Allen School, a boarding school in Asheville in 1956. 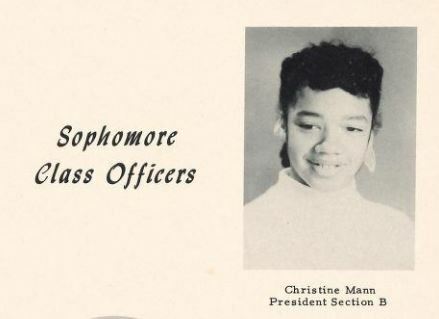 She served as a sophomore class officer while at Winchester. To learn more about our new partner, Union County Public Library, visit their partner page here. To see more yearbooks from across North Carolina, visit here.